Hope's Cafe: Demolishing (Supposed) Bible Contradictions- Book Review! Demolishing (Supposed) Bible Contradictions- Book Review! I am very blessed to be a book reviewer for New Leaf Publishing Group. I was thrilled when the opportunity came up to review a new book compiled by Ken Ham, (founder of Answers in Genesis). The book is one I have had my eye on for a while, waiting for a chance to purchase. 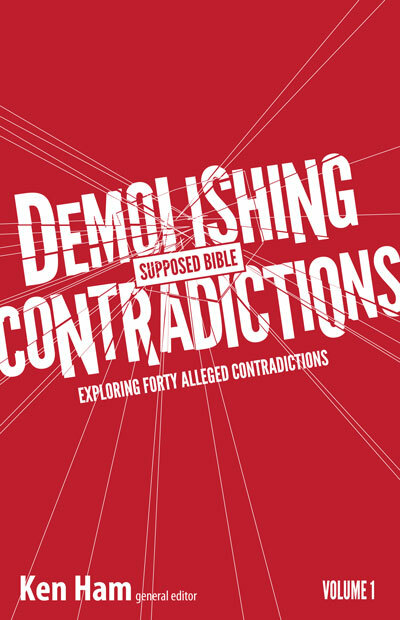 It's titled Demolishing Contradictions, and covers 40 supposed contradictions in the Bible. I have so many people tell me "Don't you know your Bible has contradictions and mistakes?". Then, of course, when you ask them to show you one, they get upset and walk away. But, some people honestly believe there are errors in the Scriptures, and it is important to have answers for them. Christianity does require faith, but it is not a blind faith! We need to be able to give answers to honest questions (or even to those who are just mocking), and this book is an excellent help for just that! The chapters are split up into different categories/Bible books (Genesis, Exodus-Deuteronomy, Joshua-Malachi, etc.). Some of the alleged contradictions discussed include Abel eating meat, Why didn't Adam and Eve die immediately, Does Genesis 1 teach a solid sky? How did Judas die? (that's a question I have heard a lot), and How was Jesus the Creator, if the Bible says He was also the Firstborn? I really enjoyed this book, and read it in a few days, then started over again! I really liked that the chapters are written by different people. You get a wealth of information from different viewpoints in this book! The contradictions are presented and then refuted in a very clear, easy-to-understand manner. My younger brother already started reading this, and has had no problem understanding what the author is trying to get across. 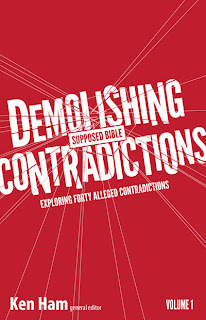 Demolishing Contradictions is somewhat reminiscent of the Answers Books (also published by New Leaf and compiled by Ken Ham), in that you are left with a stronger faith, questions answered, and are equipped to deal with those who may question, scoff and mock. I highly recommend this book to any Christian seeking for a better understanding, or who wants to be able to "give an answer to any man who asketh...". "One of the most popular misconceptions by people who have walked away from the Church and their faith is that the Bible contains errors or inaccurate accounts. Many people also simply accept without question the claim by others that the Bible is full of contradictions. Even more disturbing is that a growing number of Christians are unable to respond when presented with an apparent inconsistency in the Bible. With nearly two-thirds of young people leaving the Church when they move from home, there has never been a more important time to have a reasoned response for those who desire only to undermine your faith. This book is a great starting point in teaching you how to think and then respond to false claims regarding the Bible. It is imperative that believers are able to stand firm in their faith, and have answers to the culture’s attacks on the Bible."